Premium wine flight, and it’s of California wines, hard to find in this state. Don’t ask me why I was in Mukilteo one fine drizzly Monday afternoon; it’s a tucked- away town sitting between the I-5 Freeway and the Puget Sound, about 15 miles north of Seattle. Boeing dominates the main drive that takes you to the ferry terminal. You pass the standard strip malls and services that must be alluring to employees of this manufacturing giant. Not far from this we found a gem of a cozy yet contemporary wine bar – The Scotmans Bistro. The lure was the fact that a favorite acoustic guitar duo appears there frequently. 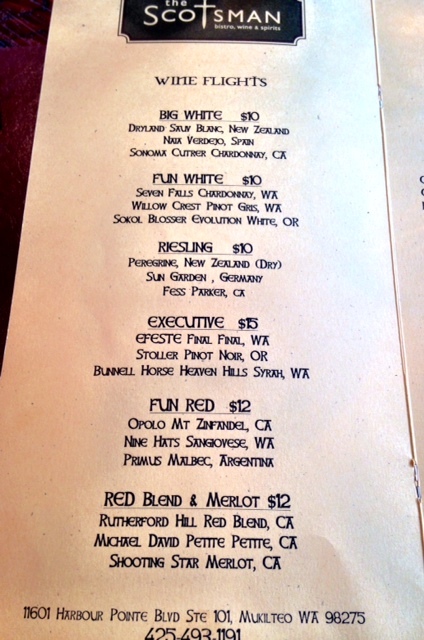 I followed the cabernet-colored link trail to a nice little lunch menu and an awesome wine flight list. I am a big big fan of wine flights, and I’ve had my share. A lot of the time, I enjoy just the tastes of wine, not an entire glass and since I cannot make up my mind usually, a wine flight is great choice. Wine flights are usually served in 3 to 4 wine glasses to a set with 1 to 2 oz. 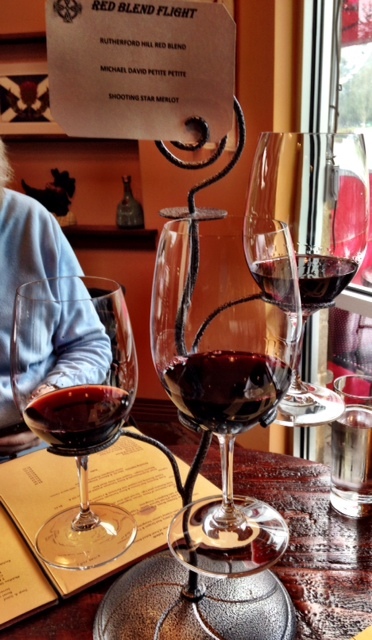 wine pours. Grouped to allow comparisons of wines that have a similar character, or grape or, just about any parameter the you can think of. For one price, it allows you to have it all! Flights that I’ve had in the past run in price range from $15 to $24 dollars. On one hand you get to try some pricey wines without committing to an entire glass. On the other hand you’ve paid the price of two really nice wines by the glass for the price of a whole bottle. Spendy. The Scotsman offers wine flights that are interesting, way affordable and arranged in an attractive “Game of Thrones” style display that is super cool. Some might say it’s gimmicky but I’m a sucker for an over the top table display so, bring it on! Link | This entry was posted in North Sound WIne Cafes, Reviews, Wine Flights, Wine Tasting and tagged Washington State Wine Bar, Wine Bar, wine flights. Bookmark the permalink.